Summer is a time for children to make cherished memories, build friendships, and, most importantly, have fun! 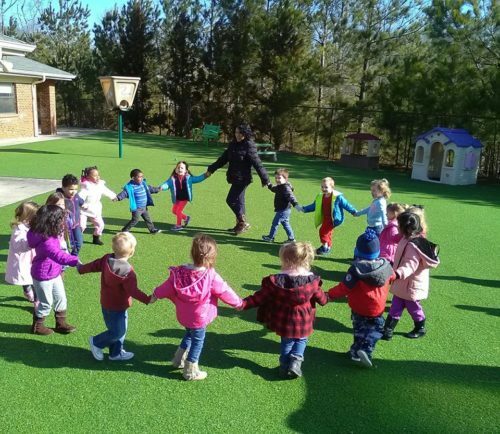 At Discovery Point Suwanee, our summer camp gives children the opportunity to discover the full potential of summer through exciting activities and creative avenues for growth and exploration. Our summer camp program allows children to get the most out of their time off from school by focusing on literature-based themes that encourage skill development and inspire challenging adventures to new locations in the world and the imagination. Our “Mighty Me” summer camp program for 2019 has been built on the foundation of engaging children’s literature selections that offer a starting point for weekly “mighty missions.” These adventures include projects, excursions, and competitions that challenge campers’ problem-solving skills and give them a real-world understanding of the importance of teamwork. Children can look forward to investigating unsolved mysteries, shining a spotlight on their own unique talents and interests, and making new friends with fellow campers. Cooking projects that inspire young chefs to explore new tastes. Physical fitness challenges and friendly competitions. Challenging puzzles that require team-building skills in addition to brainpower. Adventure-packed field trips to exciting locations. Inspiring talks from our teachers and guest speakers to lift campers’ spirits. Science experiments that help campers shed light on the world around them. Art projects that encourage creative expression and challenge the imagination. Ten weekly themes offer the inspiration for our mighty missions and hands-on activities. These themes encourage campers to learn valuable life lessons through real-world applications and allow them to gain a greater understanding of the importance of sportsmanship, friendship, kindness, and self-esteem. As children develop their strengths and improve their skills, they’ll build lasting relationships and learn how to become true team players. Our creative approach has campers take on imaginary roles that inspire them to see the world in a new light. From an expert archeologist to a clever spy and a visionary architect, these roles offer insight into the important lessons they’re learning as part of our program’s weekly themes. Don’t hesitate to learn more about what you can expect from our summer camp program in 2019. Call Discovery Point Suwanee at (770) 932-6622 or stop by our child care center today for details.